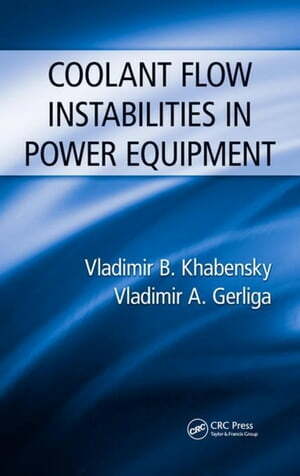 Collins Booksellers - Coolant Flow Instabilities in Power Equipment by Khabensky, Vladimir B., 9781466567054. Buy this book online. Thermal-hydraulic instability can potentially impair thermal reliability of reactor cores or other power equipment components. Thus it is important to address stability issues in power equipment associated with thermal and nuclear installations, particularly in thermal nuclear power plants, chemical and petroleum industries, space technology, and radio, electronic, and computer cooling systems. Coolant Flow Instabilities in Power Equipment synthesizes results from instability investigations around the world, presenting an analysis and generalization of the published technical literature. The authors include individual examples on flow stability in various types of equipment, including boilers, reactors, steam generators, condensers, heat exchangers, turbines, pumps, deaerators, bubblers, and pipelines. They also present information that has not been widely available until recently, such as thermal-acoustic instability, flow instability with supercritical parameters, and single-phase coolant flow static instability. The material described in this book is derived from vast amounts of experimental data from thermal-physical test facilities and full-scale installations. It is presented in a manner accessible to readers without advanced mathematical backgrounds.